If you're a long-time reader of All Things Lesbian, you may remember that way back in the ethereal haze that was 2012, I reviewed British lesbian author Kiki Archer's first novel, But She Is My Student. (Click HERE if you want to take a look). Now, in 2015, Archer has provided us, the lesbians, with her sixth novel (that's right, I said SIXTH), Too Late... I Love You. Wow, where should I start? Like her previous books, Archer's writing is so easy to read. She doesn't beat around the bush (no pun intended), and every part of her storytelling has a purpose. There is no straying away from the storyline. Too Late... focuses entirely on its protagonist, Connie, and the world that turns around her. Even when you think the plot line is going off-topic, each twist brings you back to the pivotal story and connects you back to its main character. Without spoiling too much, I'll summarise the book like this: Connie, a 'straight' lady with a boyfriend and a young son finds her solace in writing inside the cupboard under the stairs. (Yes, this is both a Harry Potter reference and a euphemism for being stuck in that closet we all know and hate.) When she realises that her life isn't as perfect as it seems, Connie meets a very interesting lady at her son's playgroup, where everything takes an unexpected turn. I really can't say any more. In fact, I've probably already given too much away. I can say, however, that this novel is a vast improvement on Archer's first novel. The editing was clearly near-perfect, the storyline was far less predictable, there was complexity within the story-telling... Everything down to the book's font was an improvement. I especially welcome back some of the very British references included by the author, specifically when she mentioned the now defunct ladies' clothes store, Ethel Austin. That one made me giggle in a way that no American could understand. This book is what all young lesbians are in search of when they start reading romance novels. 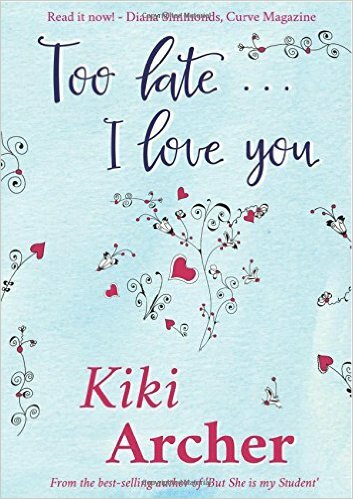 Kiki Archer is the lesbian answer to Helen Fielding (Bridget Jones' Diary), Sophie Kinsella (Remember Me? ), and Cecelia Ahern (P.S. I Love You). I for one remember reading a Sophie Kinsella book when I was around fifteen years old and thinking "why am I reading about a heterosexual relationship that I have no interest in? Oh, probably because there is VERY LITTLE GOOD LESBIAN ROMANCE FICTION OUT THERE." Hopefully, young lesbians today will pick up this book and realise there is someone out there who wants to give young women and girls that happily ever after story in a way that rings true to what their lives represent. If I had to be really nit-picky and pick a fault, I guess it would probably be my distaste of the character of Ryan; Connie's gay best friend. He's a very stereotypical, loud-mouthed, flamboyant gay man, but I kind of get that these characteristics were essential to the plot in many ways, so I can forgive it. All in all, this is possibly one of the best lesbian novels I've read (second only to Beyond the Pale by Elana Dykewomon), and I would definitely recommend it to anyone looking for an easy, gritty, yet light-hearted read. Kiki Archer is a UK-based, best-selling, award-winning author. Her debut novel But She Is My Student won the UK's 2012 SoSoGay Best Book Award. Its sequel Instigations took just 12 hours from its release to reach the top of the Amazon lesbian fiction chart, and Kiki's third novel Binding Devotionwas a finalist in the 2013 Rainbow Awards. All quickly became bestsellers in their genre. Kiki's fourth offering One Foot Onto The Ice broke into the American Amazon contemporary fiction top 100 as well as achieving the US and UK Amazon lesbian fiction number one. The sequel When You Know went straight to number one on the Amazon UK, Amazon America, and Amazon Australia, lesbian fiction charts, as well as number one on the iTunes, Smashwords, and Lulu, Gay and Lesbian chart. Her latest novel Too Late... I Love You has been her most successful to date making that transition into the mainstream contemporary romance charts. Kiki was crowned the Ultimate Planet's Independent Author of the Year in 2013 and she received an honourable mention in the 2014 Author of the Year category. Click HERE to visit Kiki's website. Stooshe To Play at L Fest 2015!